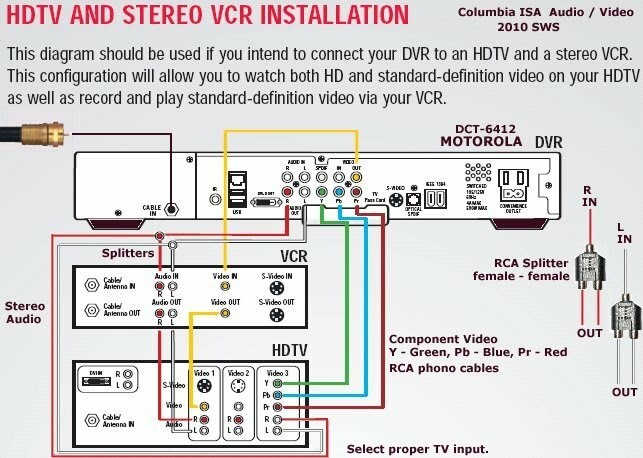 The following diagrams show how to connect VCR, TV, and cable box. Remember there are always many ways to connect components. The use of switches and adapters often allow for an even greater number of options. Converter takes the RCA cables from the VCR's output and sends to a HDMI cable connected from the converter to the HDTV's HDMI input. Then select the TV's HDMI input and you can play the VCR on the HDTV. 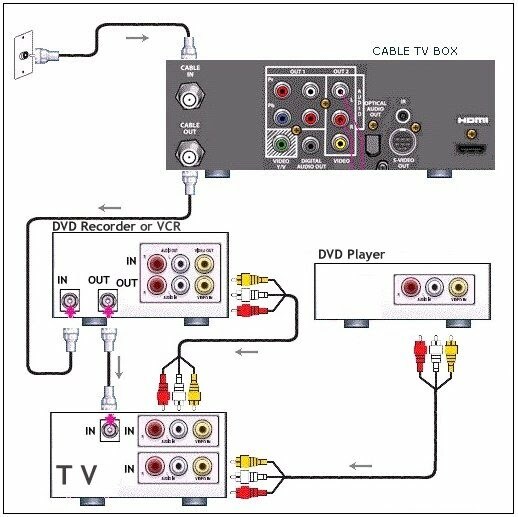 • For additional diagrams and explanations, go to Cable TV hookup diagrams as this shows VCR, DVD Recorders, RF Modulator, cable box diagrams. There are many ways to connect Cable Converter boxes, TVs, VCR and DVD recorders depending on what you want to accomplish and what resources you have available. 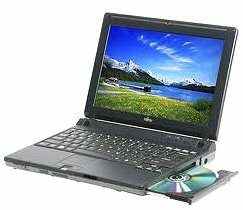 (A standard DVD recorder can be substituted anywhere you see a VCR in the images below). It automatically switches your TV to view which ever player's power is turned on, for instance your VCR or your DVD player, up to 4 players. 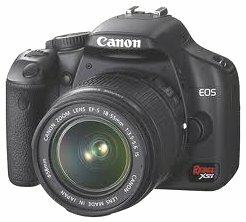 One of the input connections for the players is in the front, which is handy for quick connections to devices like camcorders or digital cameras. If none or your players are powered on, then it simply plays the cable (or antenna) feed. It has a built in RF modulator so that it works on older TVs. For newer sets it has both S-video and composite RCA (with stereo audio) inputs and output. The inputs are prioritized, the scanning speed is adjustable, and there is a manual override selector. It's perfect for those less capable members of your family who get confused when there are multiple players connected to the TV. 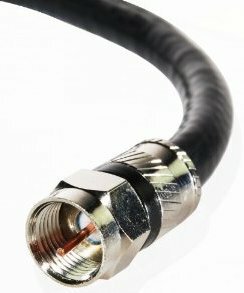 Coaxial cables (RG-6) carry video (picture) and audio (sound) together. These cables screw on/off their ports on each device. 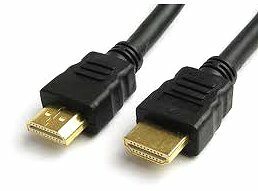 The RCA yellow cable will carry only video while the RCA white cable will carry left audio. Some VCRs also have a red RCA port for right audio, giving stereo (2 channel) sound. Only for Basic Cable TV Service subscribers who choose not to have a receiver box. 2. Cable from the "out" on the VCR, connects to the ANT/RF "IN" on the TV. 3. TV is usually set on channel 3 or 4. 4. Tune cable channels on the VCR. 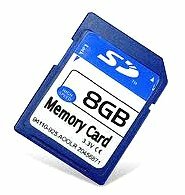 · All modern VCRs are analog cable ready. Basic analog cable TV channels usually are 2 up to 99. · Only for Basic cable subscribers. · Cannot order PPV or premium cable services. Select channel to be recorded on the VCR and press the record button. 1. One cable from the wall-plate connects into the cable box. 2. Cable from the "out" on the cable box, connects to the ANT "IN" on the VCR. 3. Cable from the "OUT" on the VCR connects to the ANT/RF "IN" on the TV. · VCR is set to channel 3 or 4 and channels are selected on the cable box. · For cable TV subscribers who want PPV or premium channels. · TV is usually set to channel 3 or 4. Select channel to be recorded on the Cable box and press the VCR record button. Playback as you would normally with the VCR. This hookup uses an A/B switch to change from cable to antenna. 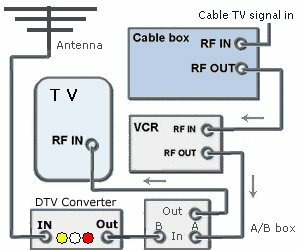 This setup allows the recording of a cable TV channel tuned on the cable receiver box, while viewing an off-air (broadcast) channel from the antenna at the same time. 1. Allows viewing of any channel tuned to and authorized for the receiver box with the A/B switch in the "A" position. 2. Off-air (broadcast) channels can be viewed with the A/B switch in the "B" position while the VCR simultaneously records any channel tuned to and authorized for the receiver box. 3. VCR playback is possible with the A/B switch in the "A" position. 1. Place the A/B switch in the "A" position. 2. Set your TV on channel 3 and view channels via your receiver box. 1. Place the A/B switch in the "B" position. This hookup uses an A/B switch connected to the output line of the cable TV receiver box and an antenna. You can record a cable TV channel tuned on the cable box, or record an off-air (broadcast) channel from your antenna. Recording off the antenna allows use of the VCR's timer feature to tape off-air channels in sequence while you're away. 1. Recording of any channel tuned to and authorized for the receiver box is possible with the A/B switch in the "A" position. The VCR timer record is available for one channel one time record. 2. 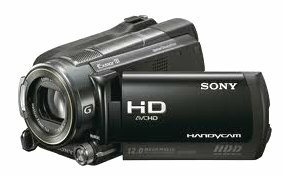 Allows for automatic unattended recording of several off-air (broadcast) channels using a programmable VCR with the A/B switch in the "B" position. 2. It's not possible to record cable channels while watching off-air (broadcast) channels with this hookup. a. Put the VCR/TV switch on "VCR." b. Playback as you would normally with the VCR. 1. Allows viewing of any channel from the receiver box on the main screen while monitoring any basic channel on the small screen of the TV. 2. 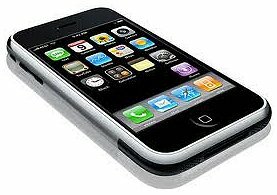 It's possible to watch any basic channel while simultaneously recording any channel tuned to and authorized for the receiver box. 3. Any channel from the receiver box can be viewed and recorded. 4. A video tape on the main screen can be played at the same time any basic channel is monitored on the small screen of the TV. 1. Two separate premium channels cannot be viewed on both the main and smaller screen. 1. Select the channel to be recorded on the receiver box. 2. Set the VCR according to normal VCR procedures for your equipment. Leave the VCR tuned to channel 3 and make sure the receiver box remains "on" while recording. 1. When you turn on the receiver box and TV, you will be able to receive the basic channels. You can control these channels by using the TV remote control. 2. Press the PIP button to activate PIP. A smaller version of the same picture should now show on the TV screen. 3. Then press the SOURCE button until the channel tuned to on the receiver box appears in the small picture. These channels can be controlled using the receiver remote. 4. Press the SWAP button to interchange the big and small pictures. This hookup uses two receiver boxes and audio/video cables connected from the audio/video output of the VCR to the audio/video input on the TV. Any channel on the main TV screen can be viewed while any other channel in a smaller picture can be monitored on the same TV. The TV must have both RF and RCA A/V inputs and be PIP capable. 1. Any channel tuned to and authorized for the receiver box can be viewed on the main screen while any other channel tuned to and authorized for the second receiver box can be monitored on the small screen of the TV. 2. Allows viewing of any channel tuned to and authorized for the receiver box while simultaneously recording any other channel tuned to and authorized for the second receiver box. 3. Any channel from the receiver box can be watched and recorded. 4. A video tape can be played on the main screen while monitoring any channel on the small screen of the TV. For an older TV without Audio/Video inputs, use an RF Modulator or an Audio/Video Switchbox. Today, many people are buying digital TV sets. 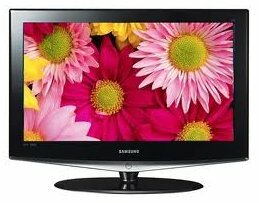 Prices have come down so that a smaller screen size digital TV may cost less than $200-$300. Many people also have only broadcast (over-the-air) TV reception. They want to record TV programs but the TV has no video output. Limited budgets may preclude buying a current DVD recorder with an ATSC tuner so the old VCR may be the only answer. Using a DTV converter box with a VCR, you can view a TV show while recording another show. 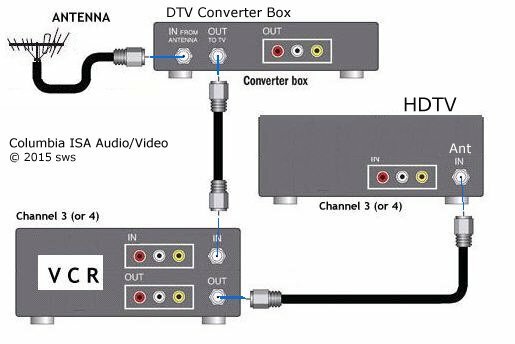 Converter boxes (or CECB in 2009 terms) are available for $20 - $40 locally or on E-Bay. 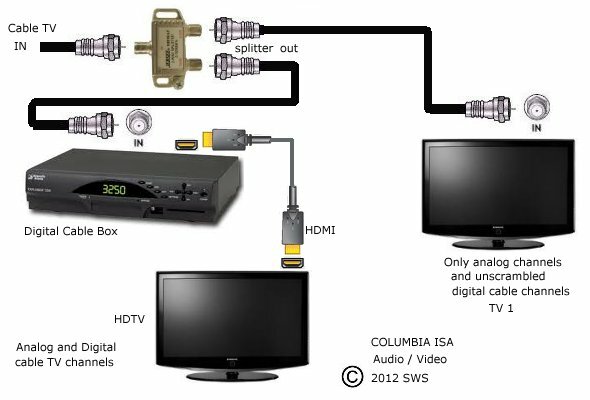 The hookup diagram below shows how to connect a digital TV converter box, VCR, antenna, splitter to your digital TV set so you can record TV shows and view broadcast TV shows. The antenna signal is split, one to the converter box and VCR and the other to the TV for normal viewing. Select antenna for normal viewing and change channels on the TV. Select A/V input on the TV for VCR viewing. Record channel 3 (or 4) on the VCR and tune channels on the DTV box. Tune Cable TV channels on the VCR. Set TV to channel 3 (or 4). Q: If I want to go with digital cable TV, how would I hookup the digital cable box? 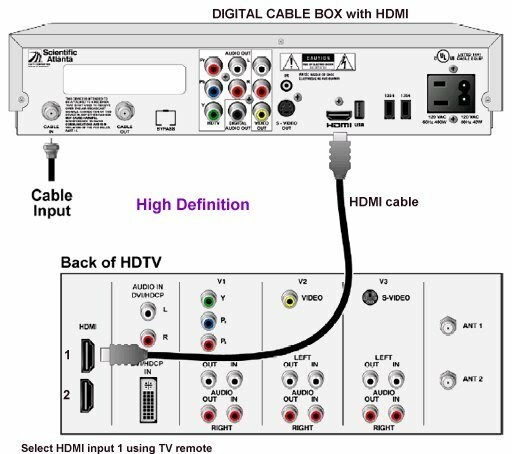 A: The digital cable box would be first in line with the cable TV provider's coax cable connected to the RF input of the digital cable box, then VCR and the rest the same as analog like before. Channels would be tuned on the digital cable box. The VCR would be connected to the cable box's RF output and be set to channel 3 (or 4). You could also connect the cable box to the VCR by using RCA cables (yellow, white, red) and setting the VCR to LINE (L1) or (L2) input. Q: Do I need a cable box for every TV in the house? A: That depends on your cable TV service and what kind of TV you have. If your cable TV service is analog and digital, you can get by without a cable box for a TV with a cable-ready tuner (analog channels only). But for the digital channels, you need a digital cable box. Each TV which you expect to tune to digital channels would need its own box unless you plan to view the same channel selected on a single box on each TV (not recommended). The exception would be unscrambled digital channels. If your TV has a QAM tuner (which most digital TVs do) then no box would be required for these channels, however you still would need a digital cable box for pay-per-view, or premium channels. 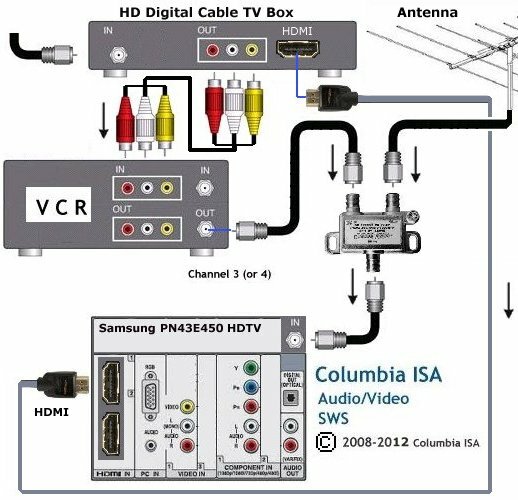 This hookup diagram shows how to connect cable box to HDTV for High-Definition and also to be able to record to a VCR. 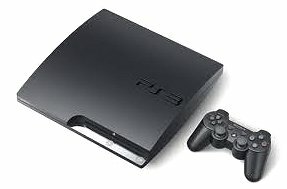 An added benefit is the capability to record or archive TV programs from a DVR to the VCR. Sound must go to the VCR and the TV so use two RCA splitters, one for the left and one for the right stereo connections to the VCR and the TV. 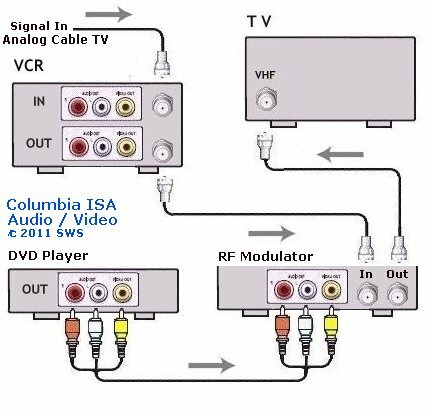 Most cable boxes have only one analog sound output so you need the RCA splitters for two sound destinations. Select proper source input on the TV using the remote. With Internet TV, you can watch a wide variety of TV shows, movies, news, and more and all on your schedule. 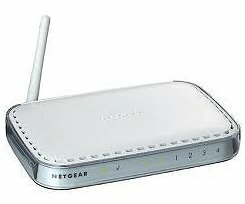 You need a broadband internet service, a modem, a TV, and an internet TV device such as the ROKU or similar devices. Cable TV is expensive, forces you to watch on their schedule and does not offer the same variety of "channels". There are some limitations and cable TV does have some advantages but internet TV is the future.